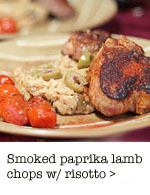 This dinner experiment was based on a recipe by Giada De Laurentiis or Little Big Head, as she is also known. 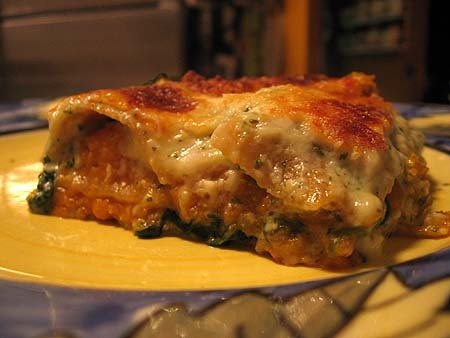 I am on the hunt for some interesting lasagna recipes, as it’s rumored that the next Donor Dinner I am cooking for work will be a lasagna-theme. Anyway, this one caught my eye. I changed a few things, like adding garlic (!!) and swapping some chicken stock for water. I also added spinach to this, because I really like spinach and butternut squash together. She also uses ameretti cookies in the original recipe, which I could not find anywhere to save my life. I substituted 1/2 an almond biscotti. Oh! And in the spirit of January, low-fat cooking, I used skim milk and low-fat mozzarella cheese — they both worked completely fine. Do not be afraid of using either item in this recipe, as it’s still very rich and satisfying…neither jwa nor I could even tell this was a “lower fat recipe”. Heat 1 tablespoon of the oil in a heavy large skillet over medium-high heat. 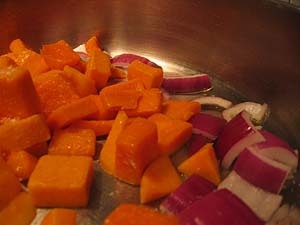 Add the red onion, garlic and squash and toss to coat. Sprinkle with salt and pepper. SautÃ© for about 5 minutes. Pour the chicken stock into the skillet and then cover and simmer over medium heat until the squash is tender, stirring occasionally, about 15-20 minutes. 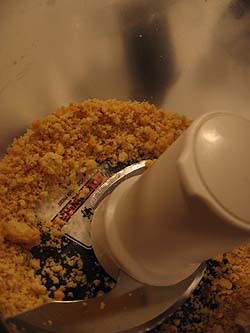 Add the cookies or biscotti to a food processor and pulse. Cool the squash slightly and then transfer the squash to the processor and blend with the cookies until smooth. If it’s too think, add more chicken stock. I probably added about 2-3 more tablespoons. Season the squash puree with more salt and pepper to taste. Set aside. Heat the remaining tablespoon of olive oil in the squash pan. Add the spinach and heat until wilted. Remove and set aside to cool. When cool enough to handle, wrap up in a clean tea towel (or 3-4 paper towels) and squeeze out excess moisture. Melt the butter in a heavy medium-size saucepan over medium heat. Add the flour and whisk for 1 minute. Gradually whisk in the milk. Bring to a boil over medium-high heat. 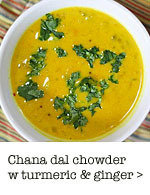 Reduce the heat to medium and simmer until the sauce thickens slightly, whisking often, about 5 minutes. Whisk in the nutmeg and red pepper flakes. 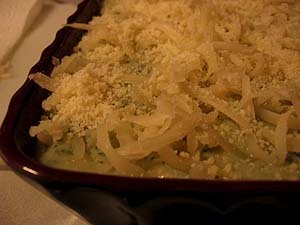 Cool slightly and add 1/4 cup Parmesan cheese. Transfer half of the sauce to a blender or food processor. Add the basil and blend until smooth. Return the basil sauce to the sauce in the pan and stir to blend. Season the sauce with salt and pepper to taste. 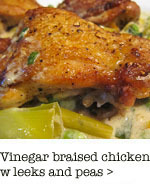 Spray a casserole dish with non-stick cooking spray and spread 3/4 cup of the sauce over the prepared baking dish. 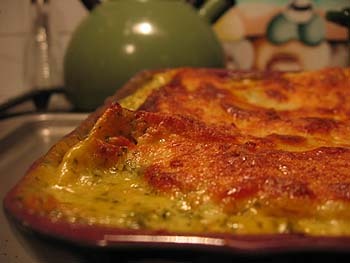 Arrange 3 lasagna noodles on the bottom of the pan. 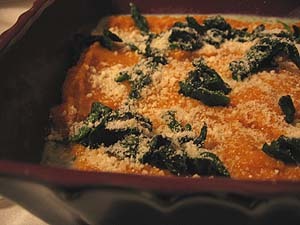 Spread half of the squash puree and half of the spinach over the noodles. Sprinkle with 1/4 cup of Parmesan cheese. Drizzle more sauce over the noodles. Repeat layering once more. Ladle more sauce on top and cover with mozzarella cheese and 1/4 cup of Parmesan. 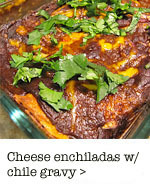 I ended up with about 1/2 a cup too much sauce but then I was using a smaller, square-sized casserole dish. I think I will just use the extra sauce on some pasta later in the week and bring it to work for lunch. Bake for 40 minutes, until the top is all golden and bubbly. Let the lasagna stand for 15 minutes before serving. This goes well with a simple salad and red wine. Wow, look at you back at it with new recipes. 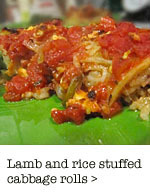 Here’s to good eating in 2006.
i am waiting for new book recs on your blog in 2006!